Americans remain mostly blind to the abusive treatment of terror suspects on US soil. Oussama Kassir received a four-month punishment for saying “As-salaam alaikum” to another prisoner. Forbidden from talking to other inmates or corresponding with anyone but his immediate family, Kassir was held in solitary confinement and denied access to the outdoors or even to direct sunlight. To protest his conditions, he went on a hunger strike and was force-fed at great pain, according to his lawyer. But Kassir was not being held at Guantánamo. He was being held at the Metropolitan Correctional Center in lower Manhattan, where he spent eighteen months in pretrial detention under these draconian conditions. Kassir, a Lebanese-born Swedish national, faced eleven charges stemming from his connections with an attempt to establish a terrorist training camp in Bly, Oregon. The Swedish government had investigated several of the charges but dropped them all for insufficient evidence. The Czech Republic, where Kassir was apprehended, would extradite him to the United States only on the condition that Kassir would not be sent to Guantánamo. So he was sent to New York, where he nonetheless encountered serious abuses of his human rights, but no public outcry. For the vast majority of Americans, there are few (if any) names that jump to mind when it comes to federal terrorism defendants. By and large, their cases are known by the gimmicky phrases attached to them when the indictments are announced: “Herald Square bomber,” “dirty bomber,” “underwear bomber.” Media coverage follows a typical pattern: first, sensationalized top-of-the-news coverage of the initial arrest—often with lurid details about “thwarted plots” and the suspect’s alleged “radicalization” taken without question from the indictment—accompanied by relief that the bad guys are being nabbed. This is followed by months, if not years, of media silence and, finally, coverage during the trial, which is usually limited to general courtroom observation with little critical analysis of the pretrial conditions, the nature of the evidence, or the pattern of government conduct across these cases. According to a yearlong study by Mother Jones and Trevor Aaronson of the Investigative Reporting Program at the University of California, Berkeley: “Once terrorism defendants have been indicted, a charge is virtually certain to stick.” This near-perfect conviction rate—the kind of figure that, seen in the context of China’s legal system or those of other foreign regimes, would be an immediate red flag—here is typically used to demonstrate how “successful” the federal system is in prosecuting terrorists. One of the most unfortunate myths of the past decade, propagated by both liberals and conservatives (though for different reasons), is that the federal system is relatively fair and incorruptible, and thus the United States had to go outside the law to abridge the rights of suspects and treat them inhumanely. This is not true. Alongside the inhumanities occurring at Guantánamo, Bagram or Abu Ghraib are the inhumanities that happen right here, in lower Manhattan and Minneapolis, in Virginia and Colorado, which follow from a long history of using the criminal justice system to punish dissent and contain unwanted or “dangerous” populations. This trust in the federal courts has produced blinders. As a result, few people have looked closely at what happens to people accused or suspected of terrorism in the federal system. The prison at Guantánamo Bay was treated as the problem, not a symptom of it. So the parallels between the treatment of terror suspects at Guantánamo and at home have gone largely unexamined, and the particular tools available under federal law to abridge the rights of suspects in national security cases go largely unscrutinized. It is time to shift our focus to these federal cases: to the assumptions of radicalization and pre-emptive prosecution that drive US domestic counterterrorism, to the deference accorded by federal courts to the government’s assertions of national security, and to the pattern of rights abridgment and the conditions of detention on US soil. When we look more closely, this is what we see: a pattern of intrusive surveillance, entrapment and government-instigated plots; overreaching “material support” charges; the use of prolonged solitary confinement and so-called special administrative measures; classified evidence; and the criminalization of Islamic speech and association. Edward Snowden’s release of NSA documents has galvanized national attention and spurred an outcry over domestic surveillance. Yet this uproar has largely focused on what is being done to all Americans, missing the fact that certain Americans have borne a much heavier burden. 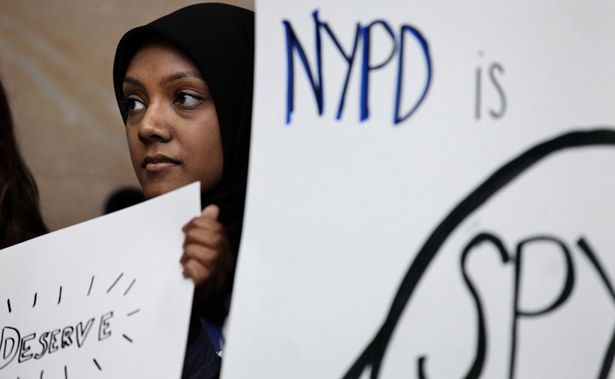 Over the past decade, as documented in a Pulitzer Prize–winning series by the Associated Press, the New York Police Department has infiltrated Muslim student organizations, restaurants, bookstores, community organizations, weddings, camping trips and mosques. In 2008, the FBI modified its guidelines to allow the surveillance of mosques and political gatherings without any evidence of wrongdoing. As of 2011, according to Trevor Aaronson and a report by Muslim Advocates, the FBI had 15,000 informants and, according to Aaronson, 45,000 unofficial ones, most of whom were tasked with providing information on Muslim-American life and association. Informants are regularly instructed by their FBI or NYPD handlers to listen and probe for anti-American sentiments. Surveillance leeches onto dissent and disrupts community mobilization. We must examine the targeting of dissent and the policing of national boundaries. Claims of national security have led to the denial of citizenship and a drastic expansion of immigration detention and deportation, as well as harsh sentencing and inhumane conditions for so-called domestic terrorists—environmentalists, animal rights activists, Muslims, black radicals. (Former Black Panther Assata Shakur was recently placed on the FBI’s Most Wanted List.) We must take a broader look at who is being targeted on national security grounds. To that end, this article is the first in a series, produced by The Nation in collaboration with Educators for Civil Liberties, to provide a systematic look at the pattern of rights abuses in the domestic “war on terror.” ECL was founded in 2008 by college faculty members concerned by the rights abuses in the case of a former Brooklyn College student and Muslim political activist, Syed Fahad Hashmi. Fahad’s arrest on charges of giving material support to Al Qaeda had topped the evening news in 2006. He was said to be a homegrown terrorist, an Al Qaeda quartermaster—a terrifying picture. But upon probing further, a different view emerged. Fahad was being held in New York, just miles away from where he grew up and from the classroom where I had taught him civil rights, in extraordinary isolation and sensory deprivation. He would spend the next three years in solitary confinement awaiting trial. An American citizen charged in federal court, Fahad was being prosecuted with evidence that he was not allowed to review. The centerpiece of the government’s case against him was a cooperating witness, Mohammed Junaid Babar, who had stayed with Fahad in his London apartment and borrowed Fahad’s cellphone. Babar had in his luggage raincoats, ponchos and waterproof socks that he then took to an Al Qaeda leader in Pakistan. Finally, part of the government’s case against Fahad—a Salafi Muslim and member of the controversial political group Al Muhajiroun—were his political activities and speeches while a student at Brooklyn College. My faculty colleagues and I, believing ourselves to be knowledgeable, informed citizens, were stunned to realize how little we knew about what was going on right under our noses—that researchers and human rights advocates, focused on the horrors abroad in the “war on terror” (Guantánamo, Abu Ghraib, extraordinary rendition), had largely overlooked the civil rights abuses happening right here at home. We initiated a petition about these concerns in Fahad’s case, which was signed by more than 550 scholars and writers in the spring of 2008. But almost no one, save The Chronicle of Higher Education and longtime civil libertarian Nat Hentoff in The Village Voice, covered it. Fahad’s family and friends, still living in Queens, New York, where he grew up, worked to draw attention to his case but encountered little help and much fear. A year later, I decided to write the story myself: “Guantánamo at Home” was published by The Nation in April 2009. That article galvanized a grassroots movement in New York, leading to weekly vigils for seven months outside the Metropolitan Correctional Center, where Fahad and others were being held. That movement was later used by the government and federal judge to justify an anonymous jury and extra security for Fahad’s trial. The day before the start of his trial, Fahad accepted a government plea deal for one count of conspiracy to provide material support. He was sentenced to fifteen years and is now incarcerated at the federal supermax prison in Florence, Colorado. Meanwhile, local movements sprang up across the country—usually led by family members and their community allies—to draw attention to other cases. From Boston to Fort Dix, from New York to Virginia, people wrote petitions, held rallies, attended court hearings and attempted to expose the government’s conduct in these cases. While many of the larger human rights groups focused on Guantánamo, while investigative journalists and academic researchers looked overseas, these small bands of people attempted to bring these domestic issues to the forefront. This work was often lonely and chilling. They faced judges who allowed the use of classified evidence, inflammatory “experts” and stings in which government informants masterminded and supplied the “plots.” The government sanctioned the use of prolonged pretrial solitary confinement and special administrative measures (which add another layer of isolation by restricting a prisoner’s communication with the outside world). Almost without exception, this produced pleas and convictions carrying long—sometimes lifetime—sentences, often under deeply inhumane conditions at the federal supermax in Florence or the Communication Management Units in Terre Haute, Indiana, and Marion, Illinois. Over and over, the mainstream media refused to dig deeper, taking these prosecutions and convictions at face value as justice being served. Over and over, appeals courts upheld these decisions, and there was little sustained public response. How Tarek Mehanna Went to Prison for a Thought Crime As the government embraces a “counter-radicalization” approach to counterterrorism, prosecutors are turning radical beliefs into criminal acts. Censored in Colorado Why did a Colorado prison prevent Fahad Hashmi from reading a Nation article about his incarceration? How Mohammed Warsame Became an Accidental ‘Terrorist’ In the wake of 9/11, prosecutors have embraced “special administrative measures” to keep terrorism suspects guilty until proven otherwise.